Welcome to the countryside village of Asahigaoka, a quaint town far-removed from the hustle-and-bustle of the big city. You couldn't imagine a more isolated setting in all of Japan. So when Tokyo-raised elementary school student Hotaru Ichijo transfers to the tiny Asahigaoka Branch School due to her father's job, she's in the for the culture shock of her life. Join Hotaru and her new friends, the eccentric Renge, and the mischevious sisters Natsumi and Komari, as they share daily adventures in the idyllic Japanese countryside. 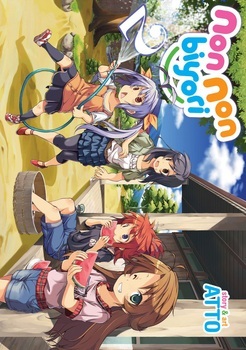 Non Non Biyori is a delightfully charming, all-ages manga series that follows the miscellaneous adventures of a group of girls in the Japanese countryside. Striking a balance between slapstick humor and heartfelt nostalgia, Non Non Biyori features artwork that beautifully depicts nature as well as adorable characterizations of its main characters . This slice-of-life gem is sure to appeal to fans of Yotsuba&! and Azumanga Daioh.